In everything there is the trace considers the mark made and the mark left behind—specifically through the act of reading. 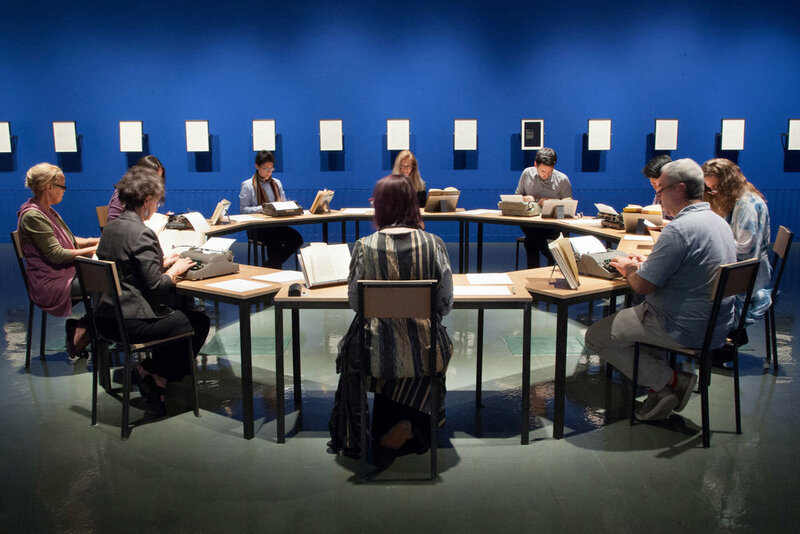 Part installation and part performance, the work highlights the interpretive nature of reading, and the ways in which reading itself is its own kind of temporal mark. The installation was commissioned by and first presented at USC Fisher Museum, Los Angeles, September 3 to December 7, 2013, but contained works by Silton dating to 2006. The USC installation expands on a process Silton began in 2006-07 when, in response to the Iraq War, she chose to reread Joseph Conrad’s seminal novel Heart of Darkness and to activate this rereading more fully by retyping its entirety on a manual typewriter. To further foreground the process and the interiority of reading, the artist typed without ink (called “stencil” mode), such that what remains is the imprint of the keys striking paper. The mark is left by the individual hand of the typist transcribing what s/he reads—an interior and personal dialogue resulting in a simultaneous presence and absence on the page. Silton would type texts in public in similar fashion, on manual typewriters without ink, in several art or gallery settings starting in 2009. Silton wanted to further explore the process in a public, collective rereading and retyping. 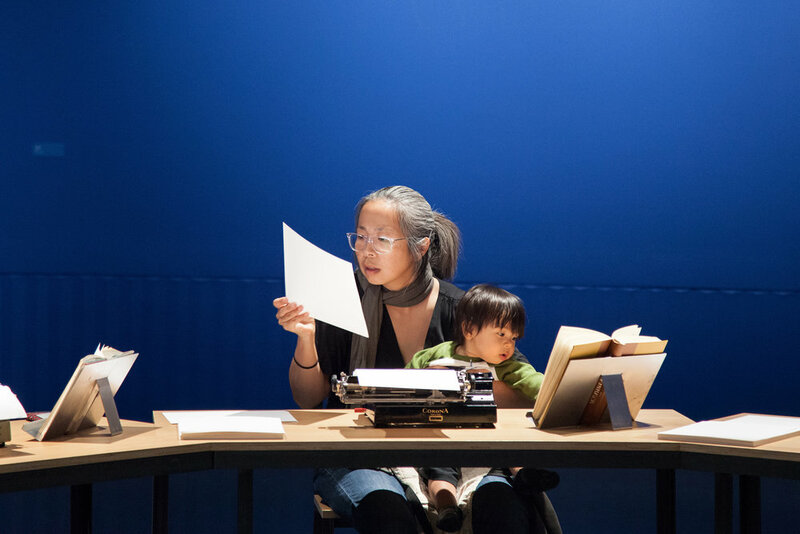 Central to the installation was a durational and collective retyping of novelist John Steinbeck’s iconic Depression-era work, The Grapes of Wrath, on a table which was constructed specifically for the activity. Silton chose the book for its significance to the west coast, for its persistent relevance vis a vis race/class struggle, human and labor rights, and issues pertaining to migration—themes that continue to reverberate as they did in 1939 when the novel was first published. The collective retyping of this novel speaks to simultaneous futility and promise, the enigmatic coupling that could also be one of many ways to refer to socio-political struggle. Silton invited the public to sign up to type for one-hour sessions within the installation. Each session consisted of ten participants who were tasked with typing a different section from the novel. Once again, all of the typing was conducted without ink, leaving only the trace of the activity. Over two-hundred people participated over a three-month period; participants ranged from university students who had never typed on a manual typewriter to those who lived through the Dust Bowl of the 1930s, and responses included reflections on the individual within collective space, labor, translation, textual slippage, and the impact of making a mark by subtle means. In return for each participant’s time and hour of labor, Silton gave a typed (inkless) and signed certificate of participation, which noted the specific day and session time. Silton worked with LA-based Knowhow Shop, founded by Justin Rice and Kagan Taylor, to design and fabricate the table that forms the sculptural centerpiece of the installation. While circular in form, the table consists of ten interlocking tables, each dependent structurally on its neighbor. 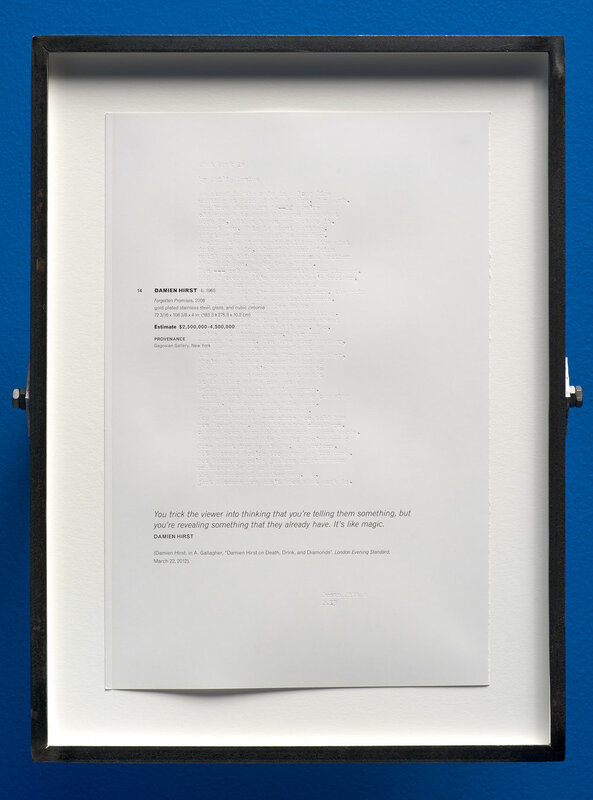 The installation also includes a series of framed wall works collectively called Appraisals (2013)—a sequence of typed poems (again without ink) over offset-lithographed pages torn from Phillips de Pury auction catalogs. The torn pages bear only a caption to a work of art, not its reproduction. The texts are familiar descriptives (name of artist, artwork title, ascribed value of work, provenance) which have become potent substitutes for the work itself in the contemporary art market. Silton has typed poems by poets including Audre Lorde, Philip Levine, Allan Ginsberg, A.E. Stallings, Terry Wolverton, among others, all referencing issues of labor and class. These juxtapositions—individually and collectively—create a very different and charged narrative.